Clouds are made up of the air (which is transparent) and droplets of water (also transparent.) So clouds are made of things which are clear. Why can’t we see through them? Why clouds are white in color, and not clear? Let’s study how can clouds be white when they are made of millions of tiny cloud droplets which are clear? why clouds are white in color? Clouds are white because they reflect the light of the sun. Light is made up of colors of the rainbow and when you add them all together you get white. The sun appears a yellow color because it sends out more yellow light than any other color. Clouds reflect all the colors the exact same amount so they look white. Isaac Newton performed a classic series of experiments over 300 years ago to demonstrate that the white light from the sun is composed of all the colors of the rainbow. Light is a wave (an electromagnetic wave) and these colors are each characterized by their wavelengths. The wavelengths of light are quite a small. Red light has a wavelength of 0.0000007 meters, just 0.7 microns. One micron is 1 millionth of a meter, so that’s pretty small—and that’s the longest wavelength your eyes can see. Blue light has a wavelength of about 0.4 microns. Clouds are composed of millions of tiny water droplets (cloud droplets) or ice crystals. The average size of cloud droplets is about 10 microns. This is pretty tiny, but these cloud droplets are much bigger than the wavelengths of visible light. Since a cloud droplet is much bigger than any wavelength of light, all the different colors of light behave the same when they hit a droplet—they scatter. Scattering means that light is redirected in random directions. All of the colors are scattered equally, so the light is diffuse and made up of all colors and the net result clouds appear white! In a summary, the Clouds appear white because of scattering. 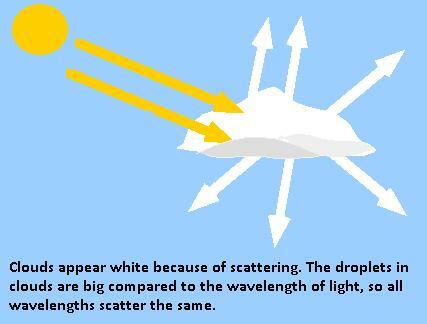 The droplets in clouds are big compared to the wavelength of light, so all wavelengths scatter the same. It’s a different story for the scattering of light from molecules of air in the atmosphere. Why the Stars Twinkle at Night in the Sky ?